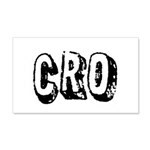 What is CRO all about? It’s all about custom ride ons, and some about stock ride ons too! This encompasses pretty much anything educational and entertaining in regards to ride on vehicles (tutorials for customizing ride ons, videos and pics of ride ons in action, and much more)! Sorry, we do not specialize in birds, or specifically crows for that matter. What’s up with the black crow? 1. Crows are scavengers by nature, which is why they tend to frequent locations inhabited by humans in order to eat their household waste. Now think about where most modders get their parts. Yeah, that’s right … one man’s junk is another man’s treasure. 2. Some crow species are capable not only of tool use, but of tool construction as well. That sounds like a modder to us. 3. Crows actively hunt and occasionally cooperate with other crows to make kills. Modders generally help each other out by locating needed parts and providing assistance on projects. 4. Crows are now considered to be among the world’s most intelligent animals. Modders are generally pretty smart. 5. The initials for this site are CRO. Duh! What can you tell me about the shop? The shop contains ride on themed apparel and merchandise for sale at the lowest prices possible. It is hosted by CafePress and includes designs by CRO. Since our prices are set as low as CafePress allows, we do not make any profit off of sales from the shop. If you have an idea for a new design, such as a personal phrase, or an additional CafePress item to be added to the shop, please let us know and we may add the new design or item for you. For one, he coined the following phrases. Why haven’t I heard any of these phrases before? You obviously don’t get out much! What else might he be known for? He runs this site and the chozian0 YouTube channel. I’m very grateful to hear that information on CRO and MPW has helped you out! Thank you for letting me know that. I found you on MPW a few moments ago and replied to your post about the Harley upgrade. Don’t worry about the $24 a year on MPW. That is simply an optional donation method to help keep the site running. If you are unable to donate monetarily, I suggest disabling any ad blocking software that you may have installed while visiting MPW. Jason Huber, the guy who runs MPW, gets a little income from the ads shown on MPW. That income helps cover the expenses of running MPW (e.g. web hosting). The same goes for CRO as well. Unfortunately, I’m not familiar with Feber products. Others on MPW may be though. I have created a thread at http://forum.modifiedpowerwheels.com/viewtopic.php?f=3&t=5051 for us to continue this discussion. Pictures would be very helpful and can be posted there. If you have trouble posting pictures to that thread, I sent you my personal email address in a PM. I removed the phone number from your original comment for security purposes. I wouldn’t want a spammer or prankster calling you. Chris, please let me know if you receive an email notification for this reply. I’m testing out a new feature on CRO. Thanks in advance! Yes I received an email. Thank you. I work second shift. I will try to post pictures hopefully tonight when I get off work. Doing this right now from phone. I saw your YouTube video about the 12v Kawasaki super shock and I love it. Where can I find that bike for my daughter? Unfortunately, the 12V Power Wheels Kawasaki Super Shock dirt bike has been discontinued for quite some time now. I don’t see a comparable model that is currently being sold. At this time, you would have to buy used to get it. I recommend posting a want ad on craigslist for your geographic location. You could also post a want ad on forum.modifiedpowerwheels.com. A forum member nearby may have one available to sell you. Good luck! The battery is most likely bad, especially if it is an original. Remove the battery from the motorcycle and take it to a battery store such as BatteriesPlus. Ask them for an equivalent replacement. They will tell you the voltage. Then you can set the correct voltage on your charger. Unfortunately, I sold my only Grave Digger hood within the last 2 weeks. If I come across one or find someone who has one, I’ll let you know. I also replied to your personal messages on the MPW forums. Would you send me the schematic? In Hungary I can’t buy a new controller. On the others, the batteries are not so good. Do you happen to know where can one find gearboxes/motors and the relevant circuitry? forum.modifiedpowerwheels.com is a great resource for wiring diagrams and buying parts from reputable hobbyists. You may also want to take a look at http://www.mltoys.net/zencart. If there is something specific you are looking for, please let me know. I do not make these vehicles from scratch, but have modified a number of stock vehicles for various reasons (e.g. speed increase). None of mine were available for online ordering without local pickup. In the past, I would occasionally list them for sale on craigslist to those in my local area. The primary purpose of this site is to act as a resource hub for those interested in modifying their own vehicles.